ZBrush includes several parametric primitives which, when combined with masking and initializing options, allow you to create thousands of different shapes. Experiment by changing the default settings in the Tool > Initialize sub-palette. (This sub-palette is only available when a parametric object is selected.) Primitives are strictly an object generator and cannot be sculpted on as they are. 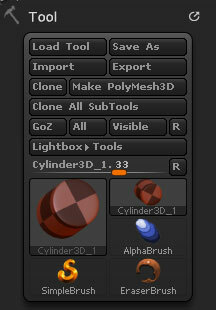 To sculpt a primitive, turn it into a Polymesh by pressing the Tool > Make PolyMesh3D button. The Tool palette when a primitive is selected. The primitive has been modified using Initialize settings and masks.